This evening featuring choreographers from British Columbia was in honour of Canada’s 150th anniversary, but other than the choreographers being Canadian and representing Canadian dance abroad, there was little connection between the theme and the four works presented. That’s not to say that the works were not worthy of inclusion, but they could have been placed on any mixed bill. 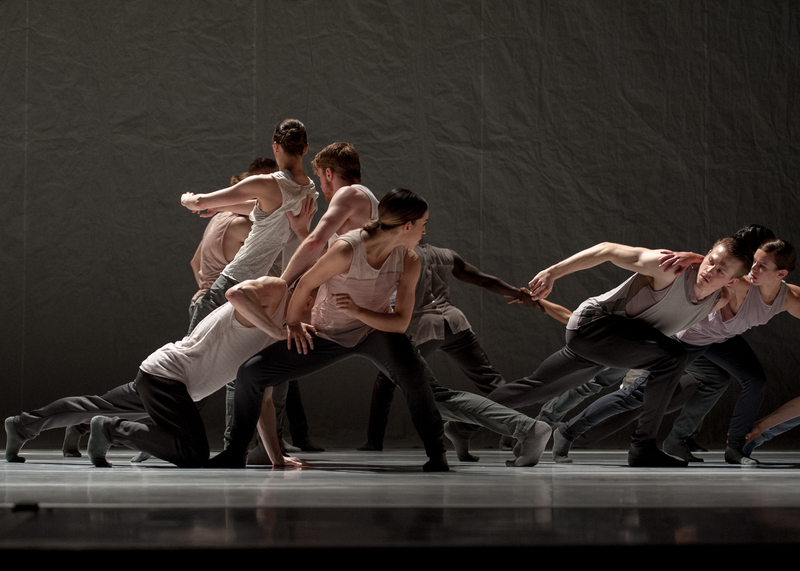 Company 605, led by partners Josh Martin and Lisa Gelley, is a powerhouse contemporary dance company that always impresses with their edgy movement and collective sensibilities. In Anthem, a large group of dancers stand in a pulsing cluster against a white backdrop. It seemed repetitive at first, with the groups remaining in the same spot, performing variations on the same movements. Their undulations grew larger and eventually the group dispersed, but they remained connected to the beat of the base heavy music with sharp movements and many stops and starts. The group stayed connected, moving in a kind of swarm with anyone’s movements affecting the others. While I enjoy this style of choreography, it seemed a bit monotonous and it isn’t the best work I’ve seen from Company 605. It was also hard to reconcile seeing the dancers of Ballet BC in a piece that is much more on the contemporary side of the dance spectrum as opposed to being contemporary ballet. But this raises the question of where that dividing line is, and if there should be one at all. Wen Wei Wang’s Swan showed the duality between light and dark, between the black and white swan. Christoph von Riedemann started the piece with a dramatic solo, going en pointe on his black dance runners. A few pas de deux couples demonstrated the tension between the opposing forces of light and dark and how that manifests in relationships. The most compelling scene, though, was the finale with Andrew Bartee straddling the two ballet barres upstage, manoeuvering with gymnastic flexibility and balletic grace while reminding us of our mortality. Emily Chessa and Brandon Alley were well chosen to perform the duet, If I Were 2 by Lesley Telford. Set to poetry spoken and composed by Barbara Adler, the piece was inspired by the myth of Narcissus and the way we interact with our reflections on surfaces as well as the way we are reflected in other people. This was a very cool concept, conveyed clearly through the spoken word and interpreted beautifully by Chessa and Alley. It was also refreshing to have poetry serve as accompaniment to the movement. The final piece of the evening, Crystal Pite’s Solo Echo, returned to the Ballet BC stage after wowing audiences in November 2015. As snow falls at the back of the stage and a yearning violin plays, the dancers, dressed all in black, perform Pite’s furtive, fluid choreography. The effect is magical, and the dancers’ movements are as smooth as the falling snow. The final scene of dancers slipping through each other’s arms and disappearing offstage is haunting.